I know it’s not really news, news, but I thought it was neat. 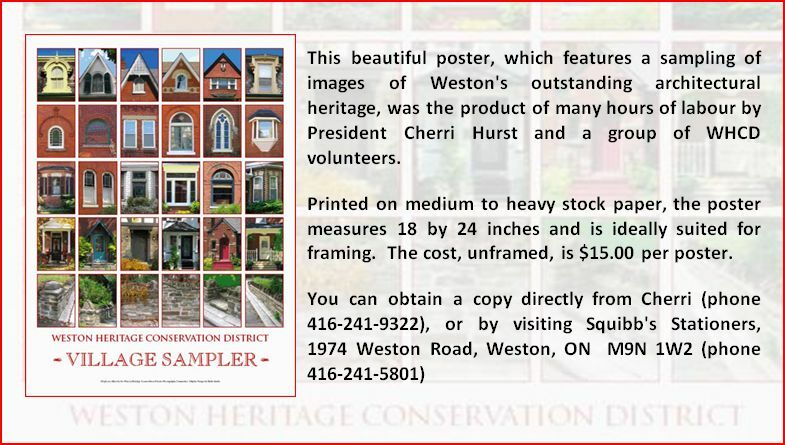 Squibb’s Stationers on Weston Rd has a lovely poster for sale to raise money for the Weston Heritage Conservation District. The poster shows a street scene made from a montage of local houses. It looks to be quite lovely. Thanks Adam for the posting! We also have the 1878 map for sale and if you buy both together, you get a discount. Each are $15 but together they are $25 — a deal to be sure. Both are printed on excellent quality stock and are beautifully presented for framing.